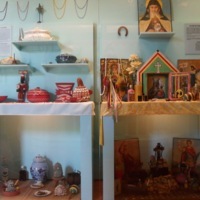 On the left side of the photo at the very top are four necklaces (elekes). 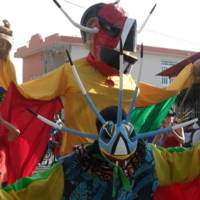 From left to right are Elegua, Ochún, Changó and Yemayá. 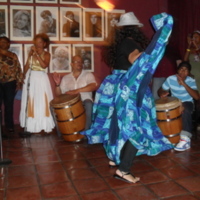 See below an explanation for each of these Orishas. 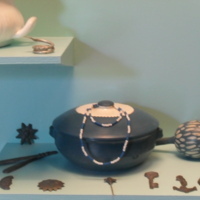 Yemayá’s turin and necklace (eleke). 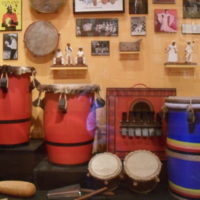 To the right of the turin is a rattle to call Yemayá down to earth. 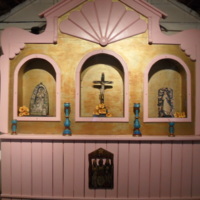 Other objects on the altar represent Yemayá. 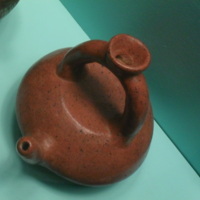 Ceramic libation vessel. 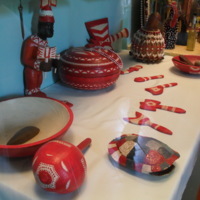 This vessel can be used in a number of ways when performing ceremonies for the Orishas. 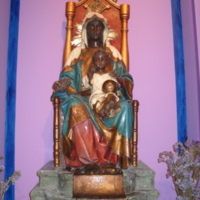 Hand carved Christian statue of virgin and child. 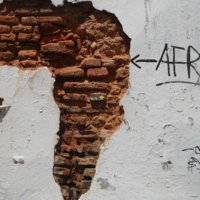 Piece of cement facing that fell off of a brick building in the Old Juan area of Puerto Rico, created the image of Africa. 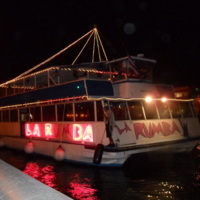 Catamaran boat called “ La Rumba” docked in the San Juan, Puerto Rico harbor. 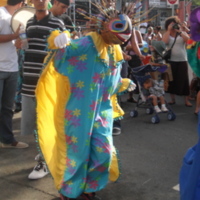 Bomba dancer dancing to the beat of the barilles (bomba drums.) 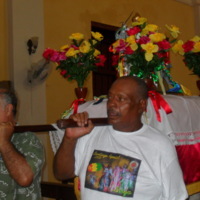 In the background is Tata Cepeda on the microphone. 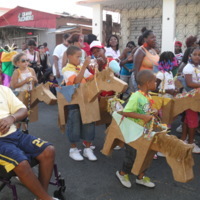 Citizens of Loíza Aldea, Puerto Rico in a parade on the day of Santiago apostol. 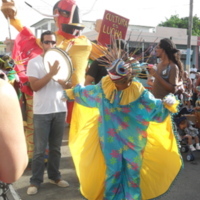 Citizens of Loíza Aldea, Puerto Rico dressed as vejigantes marching in a parade on the day of Santiago apostol. 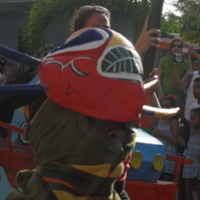 Vejigante, Loíza Aldea, Puerto Rico on the day of Santiago apostol. 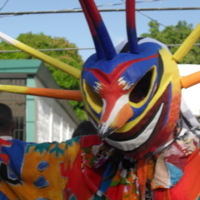 "Cultura es lucha" means "culture is struggle". 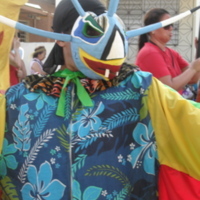 Young boy dressed as a vejigante. 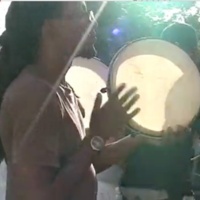 Loíza Aldea, Puerto Rico on the day of Santiago apostol. 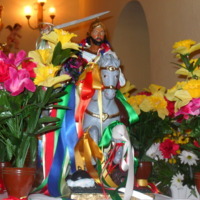 Statue of Santiago apostol. Loíza Aldea Cathedral in Puerto Rico. 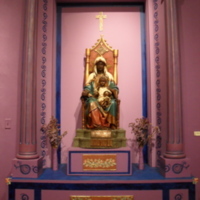 Loíza Aldea Cathedral in Puerto Rico. 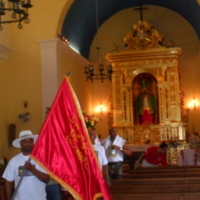 Citizens of Loíza Aldea carrying statue of Santiago apostol from the cathedral. 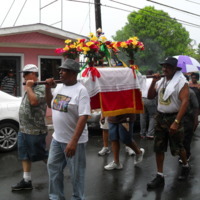 Citizens of Loíza Aldea carrying statue of Santiago in procession. 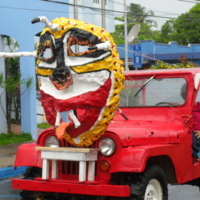 Jeep with huge vejigante mask leads the procession on the day of Santiago apostol. 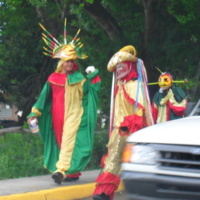 Two citizens of Loíza Aldea dressed as vejigantes and another dressed as one of the “caballeros.” The caballero is a popular figure during the festival of Santiago apostol.